We are developing an online option backing test tool for “30 day trading”. This back tester allows you to interactively show the historical results for using monthly options to manage the risk of long term ownership of stocks or ETFs. Currently the strategy back tester does historical back testing for the Collar strategy (long stock, short call 1 month out, long put 1 month out). It could also be extended to included short call “income methods” such as vertical call spreads or 2:1 call ratio spreads. 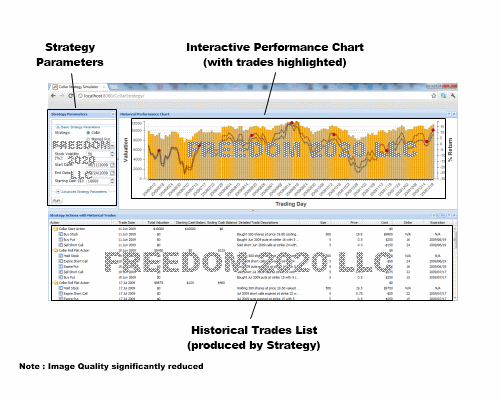 “30 day trading” provides an interactive online view of back testing a strategy, giving a dynamic view of historical strategy performance. This is similar to the historical collar strategy results outlined in this optionseducation.org white paper (unaffiliated 3rd party research). Would you be interested in trying out a live test demo of the product prototype ? Please note: This demo works best in the latest versions of the Google Chrome and Firefox web browsers. It does not currently fully work in Internet Explorer (but it is planned to ultimately work on that platform).